100th anniversary as a conference, a couple of nonviolent protesters gathered nearby. One was seeking dialogue with church leaders to urge them to offer sanctuary to immigrants facing deportation, and another voiced displeasure with church leaders he said support war. 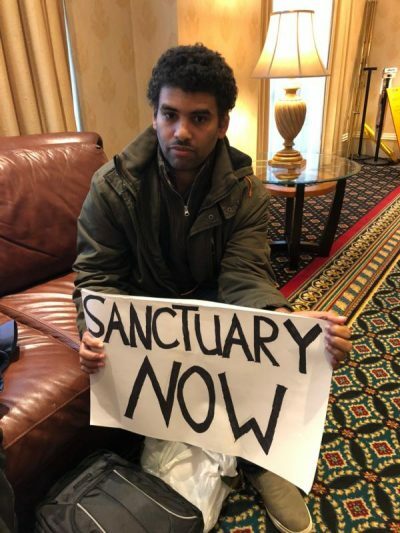 Felix Cepeda, a Catholic from New York City involved in the sanctuary movement, held a sign that said “Sanctuary Now” Nov. 13 in the lobby of Baltimore Marriott Waterfront, where the meeting was being held. He said he was fasting and praying for three days, hoping that bishops would hear his pleas to open up at least one parish property as a place of sanctuary in every diocese for a family or any immigrant facing deportation. In response the U.S. Conference of Catholic Bishops issued a statement, saying it shares the concern for migrants and refugees but that there is not only one way to be of service. “No doubt there is fear among the immigrant community. The bishops never tired of saying to immigrants, ‘We are with you.’ That being said, the proper role for the conference is to provide resources to member bishops so they can make the best decision for their own diocese,” the statement said. “In many ways, the church has stood by immigrants and refugee families, including advocating on their behalf with the administration and congress as well as community awareness resources that help ensure that they know their rights,” it said. He said he recently helped a Catholic woman find sanctuary in an Anglican church because he couldn’t get help from the Archdiocese of New York as she faced deportation. Though Catholic Charities offered a lawyer, the lawyer was too busy to meet with her, he said. Bishops’ stances vary on sanctuary for immigrants facing deportation. Bishop Jaime Soto of Sacramento, California, for example, has said that in the event of mass deportations, Catholic churches in the diocese should stand ready to offer sanctuary to these immigrants. Meanwhile, Cardinal Donald W. Wuerl of Washington has said that while the Catholic Church’s values mandate opposition to deportation of people already living in the United States, there is no certainty that immigrants staying on church grounds would avoid being arrested and eventually sent to their home country. “When we use the word sanctuary, we have to be very careful that we’re not holding out false hope,” he said in a March 2 interview with editors of The Washington Post daily newspaper. In Cepeda’s view, the church could use many closed properties in New York, and elsewhere to help its own. Mark Scibilia-Carver said he was protesting at fall assembly because the USCCB was marking its 100th anniversary of its formation as the National Catholic War Council. The council was established to address issues brought about by World War I, including the spiritual needs of soldiers and the needs of refugees in wartime. Christians cannot support war, said Scibilia-Carver, who held a book he called a scroll of remembrance of Catholics who have died in Iraq and Afghanistan. He said U.S. bishops and other church leaders need to listen better to pope’s anti-war stance. The evening before Scibilia-Carver was in front of the Basilica of the National Shrine of the Assumption of the Blessed Virgin Mary with some of his anti-war signs. Inside Mass was celebrated to mark the centenary of the USCCB. The book he held included homilies for funerals for some of those Catholics who died in which he claimed the celebrants glorified war. “I’m a witness to nonviolence,” which is what the Gospel calls for, he said, adding that he objected to what he believes is a contradiction in bishops saying they are anti-war but support U.S. troops. Though only the two men were present to protest, Cepeda said he had called on others locally to come out and support his cause while the bishops gathered in Baltimore.